Atlas Distribution and Ketchup Entertainment opens A Royal Night Out at Regal E-Walk on December 4th, 2015. NYC MOVIE GURU: What do you find appealing about period pieces? Sarah Gadon: It's an interesting opportunity to look back at time from a different perspective. Too often, we learn about history from the vantage point of one group of people or one person, so I think that film offers a unique perspective from a point in time and a perspective that we haven't seen before. That's what makes it so compelling about doing period pieces. From an acting perspective, I love playing women from different points in time--whether it's the 40's, 50's or 1700's, I love getting lost in the period. NYC MOVIE GURU: Would you want to become a royalty if you had the chance? SG: I like my life the way that it is. [laughs] I love being able to dip in and out of people's heads, but I don't know if I'd want to spend my life as part of the royal family. NYC MOVIE GURU: When it comes to portraying a real-life person vs a fictionalized one, which of those is more challenging to you as an actress? SG: I don't think that one is more challenging than the other, and my approach isn't different either. I like to do a lot of research when I'm preparing for a role by way of watching films, reading about the time period, and listening to music and learning a dialect. It really doesn't change when you're playing somebody real other than the kind of material that you're researching and how much it is about that point in time per se. For this film, I've done a lot of research. I went to school where I studied Cinema Studies, and I love research. That's just a part of who I am. For A Royal Night Out, I got to read a lot about Elizabeth and I got to work with the dialect coach, and learn how to windyhop. I took etiquette classes and spoke with a royal consultant. NYC MOVIE GURU: What questions would you have asked Queen Elizabeth if you were to meet her? SG: I think I would ask her all about what her favorite things are because part of being royalty is that you don't really get to show your preference. NYC MOVIE GURU: Would you have liked to live during the 1940's when the film takes place? SG: I love that time period. It was a really interesting time for women, so I would for sure love to live in that period. There were really interesting films being made at that time, and really strong leading ladies. It was a really great time to be alive. I felt a lot of nostalgia and felt great that I got to do something that was set in the 40's. NYC MOVIE GURU: How different would Elizabeth and Margaret's experiences on VE Night be if today's technology existed back then? SG: I think it would be really different in the sense that it's really hard to get lost in the world that we live in now. It's hard to go incognito because everybody has a camera and iPhone in their hand. VE Night was such a celebration. It was the first time that the world could celebrate after WWII and living in London under hardships. People were looking to celebrate at the time and not really looking for the Princess Elizabeth, so maybe she would've gotten away with it. NYC MOVIE GURU: It's quite refreshing to see a film that can't be turned into a video game these days! NYC MOVIE GURU: I believe that CGI should be considered as standard effects while anything related to humanism is a truly special effect. Do you agree? SG: Yes, absolutely. That's what I fell in love with about this story. It's about the princess as a young woman, and it's a coming-of-age story. I know that the circumstances that we created in the film are fictional, but the feelings are real. 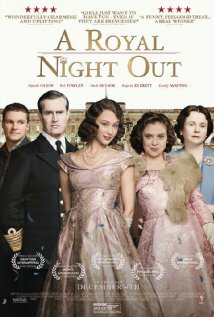 NYC MOVIE GURU: A Royal Night Out seems very accessible to adults and teenagers which is rare for a period piece. Why do you think that period pieces are rarely accessible for teenagers? SG: Maybe because they're just told from one perspective or they can be heavy or a talking-heads film. Christophe Beaucarne, A Royal Night Out's cinematographer made the film move. It's a chase film at the heart of it, so I think that that's why it feels like it has gumption. What I love about coming-of-age stories in general is that they appeal to everyone. They're about a universal experience. As much as this appeals to teenagers, whenever I go to a screening of it, a variety of people enjoy it---people of all ages. That's something that I really love about the film as well. NYC MOVIE GURU: What do you think Elizabeth ultimately got out of her experiences on VE Night? Was it perhaps a way for her to express her individualism? SG: We know that on VE Night, Elizabeth and Margaret went out with a group of people. Beyond that, we don't know what happened. Our film suggests that a lot of things probably didn't happen, but I think what I loved about Elizabeth in A Royal Night Out is that she gets to know who she is with other people. She always had a strong connection to her people, and always felt the same sense of duty to them. In this film, you understand why. NYC MOVIE GURU: You're a very charismatic actress. Are you capable, though, of detecting your own charisma? SG: I love people, and I'm fascinated by people and energized by them. I love that human connection. That's the reason why I am an actress. But whether I can detect my own charisma, I don't know how to answer that. NYC MOVIE GURU: Are there any actors from the Golden Age of American Cinema that you would've love to work with? SG: Oh yeah! At the end of A Royal Night Out, there's a shot of me driving the car which symbolizes Elizabeth taking control of her own life and having this sense of autonomy. When I watched that shot, it was reminiscent of Katharine Hepburn in Christopher Strong driving the airplane. I love Katharine Hepburn and feel a real connection to her strength, I think. I would have loved to work with her. I also would have loved to work with Dorothy Arzner who I think she was an incredible director at that time who really played with genre and pushed a lot of boundaries for women in Hollywood. The dancer in me would love to be in An American in Paris. I love that film. I watch it every summer. There's something special about it. NYC MOVIE GURU: Would you want to star in a black-and-white film? SG: [laughs] I love black-and-white, so yes, I would love to work in one. NYC MOVIE GURU: Do you think that something would be lost by watching A Royal Night Out on the small screen? SG: I can't wait for the film to be on Netflix and have it reach a wider audience of people who wouldn't have been able to see it at a movie theater. NYC MOVIE GURU: How challenging is it for you to find a complex role as an actress? SG: I don't think that it's so much about finding a complex role than it is about finding an interesting character and making them compelling. You can't just wait for those roles to come along because they're so few and far between. I really made a career out of taking characters and making them interesting. That's my job as an actor. NYC MOVIE GURU: How do you imagine A Royal Night Out if, in a parallel universe, it were a full-throttle Hollywood film filled with CGI?? SG: I would definitely make it into an action film. It has all the elements of an action film because it's a chase film as its heart. I would definitely throw in some massive action sequences, preferably between Elizabeth and Jack as they fight off the Red Caps. NYC MOVIE GURU: What would make an interesting double feature with A Royal Night Out? NYC MOVIE GURU: What about something different that's more downbeat?